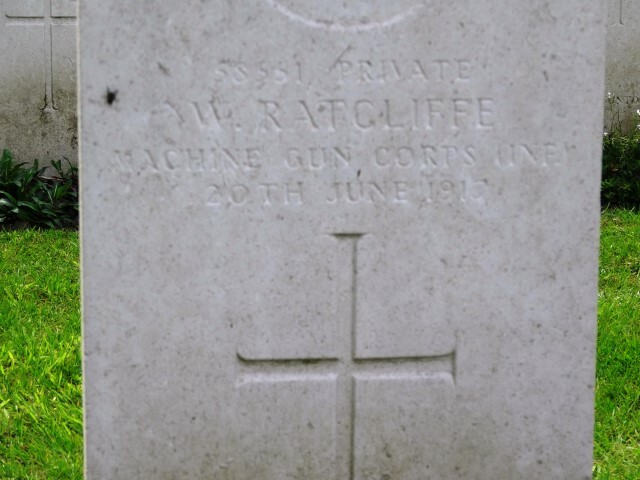 58551, Private W. Ratcliffe, 191st Company, Machine Gun Corps (Infantry) was killed in action 20 June 1917 and is buried at Spoilbank Cemetery, south of Ypres, Belgium. He was 19 years old and is commemorated on the St. Helen’s Colliery Memorial Cottages and the War Memorial in the St. Andrew’s churchyard, South Church, Bishop Auckland. The Memorial Cottages panel commemorates W. Radcliffe serving with the DLI and the South Church War Memorial commemorates Ratcliffe W. serving with the DLI. John worked as a railway engine stoker. Being a railwayman, John would have been well aware of the employment opportunities that existed to the east on the Durham coalfield and perhaps Walter was encouraged to head over Stainmore to the Auckland area to try his luck. It seems that he found work at St. Helens Colliery. The next action was not until 31 July 1917 when the 24th Division was involved in the Battle of Pilkem Ridge as part of the 3rd Battle of Ypres. 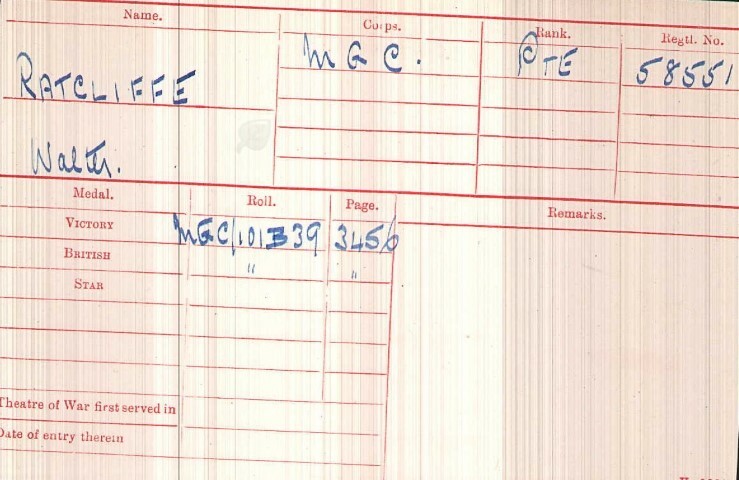 The service record of Private W. Ratcliffe and war diary of the 191st MGC has not been researched therefore the exact details surrounding the circumstances of his death are unknown to date. It is highly likely that he saw action at Messines and was killed in action during the subsequent hostilities. 9 other MCG (Infantry) servicemen died 20 June 197 but none served with 191st Company. Private W. Ratcliffe was awarded the British War and Victory medals which infers that he did not enter France before 31 December 1915. 588551 Private W. Ratcliffe is buried at grave reference I.AA.1, Spoilbank Cemetery, near Ypres, Belgium. 1901census. He has not yet been traced on the 1911 census. Which brigades has not yet been researched but it would be unlikely that they would have taken part in any offensive action without support from the MCG.